Safety and reliability are two of the most important aspects when it comes to the development of medical devices – quite naturally, since human lives may be dependent on them. As a consequence, ensuring the high quality of products used in the medical field is a top concern. Strict regulations and international standards specify the general requirements related to not only the medical end products themselves, but also the processes used in their development. In the case of simple hardware or instruments such as needles or scalpels, quality assurance (QA) and compliance with relevant standards may seem manageable. However, complex modern medical devices are increasingly relying on embedded software, furthering the importance, as well as the level of difficulty involved in their QA & testing. Compliance with the adequate regulations (IEC 62304, ISO 14971 or US FDA CFR Title 21 Part 11 are some of the relevant standards for medical device software developers) is of paramount importance in the development of these medical devices. To be more precise, as a medical device developer or manufacturer, ensuring that both your development processes and your end products fit the requirements set forth by these industry standards is a bare necessity. Not only could it save you a great deal of costs and trouble (lawsuits, product recalls, damaging your reputation etc.) – and more importantly, of course, the lives of many patients – it is also mandatory in more and more cases. Related eBook: Read our Fritz Stephan Case Study to find out out how an innovative German medical device developer complies with both medical and avionics standards at the same time! 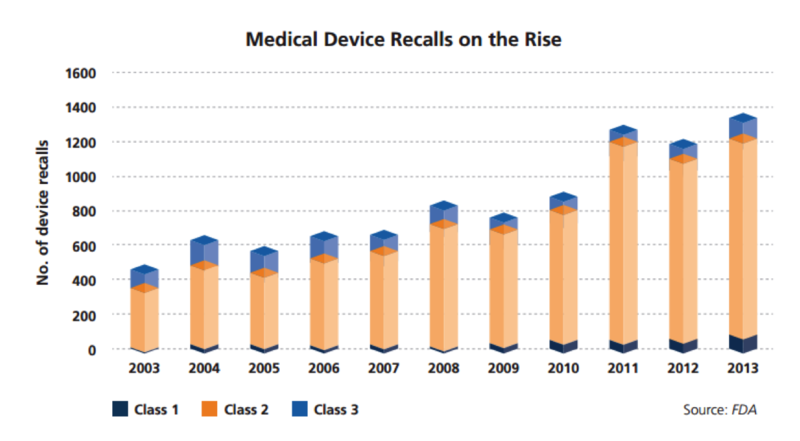 The growing number of medical device recalls in recent years is most likely a direct consequence of the increasing complexity of software-driven devices. FDA research has reported that software design failures have been responsible for a large portion of these recalls, accounting for about 15% of all device recalls between 2010 and 2012. The more your devices are reliant on software, the more you have to step up your QA efforts to avoid grave consequences. So how does one ensure compliance while managing the already complex processes involved in development? As an internationally harmonized regulation used both in the EU and the US, this standard aims to ensure the safety and quality of your end product (which, in this case, is a piece of software, whether it's a standalone piece of medical software or software embedded in a medical device). The standard covers everything from planning through design and risk management all the way to testing, release and maintenance. In addition to its advanced features and functionality to support compliance with IEC 62304, codeBeamer ALM offers a dedicated IEC 62304 Medical Template with preconfigured workflows (with Title 21 CFR Part 11-compliant e-signatures), trackers, a medical wiki with valuable domain knowledge, release- and document management. These ensure full traceability and auditability throughout the development lifecycle. To find out more about IEC 62304 compliance with codeBeamer, please feel free to download our medical brochure. For a practical demonstration, watch our webinar recording at the bottom of this article, or simply get in touch with us! ISO 14971 is a standard that governs risk management in medical device software development. The standard covers risk analysis, the documentation and reporting of the risk management lifecycle, as well as residual risk analysis and monitoring of the device in operation. Specifically, it regulates the assignment of risk management responsibilities, risk and residual risk analysis, the creation of risk management files, documenting the intended use of the system being developed, and post production monitoring & reporting.